The fifth film in the Marvel Cinematic Universe, Captain America: The First Avenger, has been given a 4k upgrade and will release to Ultra HD Blu-ray on Feb. 26, 2019. As well as a common 2-disc 4k Blu-ray edition ($29.99) with Blu-ray and Digital UHD copy, Best Buy will release a limited edition SteelBook version for $34.99. Extras will be the same at the previously-released Blu-ray editions. The UK’s Zaavi is also selling the SteelBook edition. On 4k Blu-ray, Captain America: The First Avenger is presented in 2160p at 2.35:1 aspect ratio. Like other Disney/Marvel titles, High Dynamic Range is provided to enhance the color depth via HDR10. Audio formats have not yet been revealed. [Update: The soundtrack is, indeed, provided in Dolby Atmos!] But, considering the last release of ‘The First Avenger’ to Blu-ray featured a DTS-HD Master Audio 7.1 soundtrack, it would be expected that Disney/Buena Vista steps up the audio to Dolby Atmos. 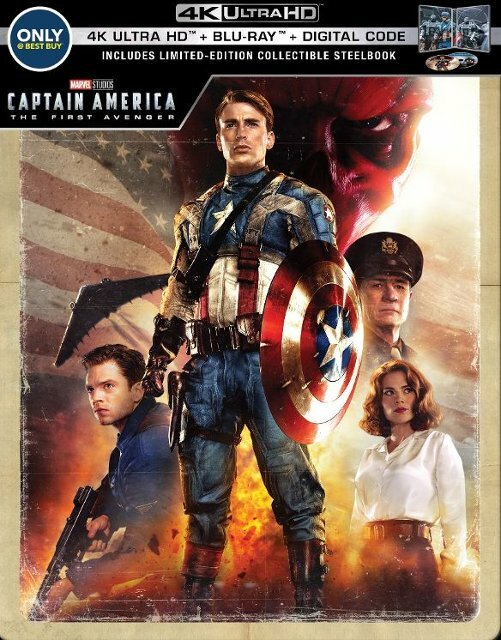 The 4k Blu-ray edition ofCaptain America: The First Avenger includes previously released extras such as featurettes, audio commentary, deleted scenes (more details below). Captain America: The First Avenger (2011) was the first film in what’s now a trilogy that includes Captain America: The Winter Soldier (2014) and Captain America: Civil War (2016). The film also served to set up The Avengers franchise films that started with Marvel’s The Avengers (2012). 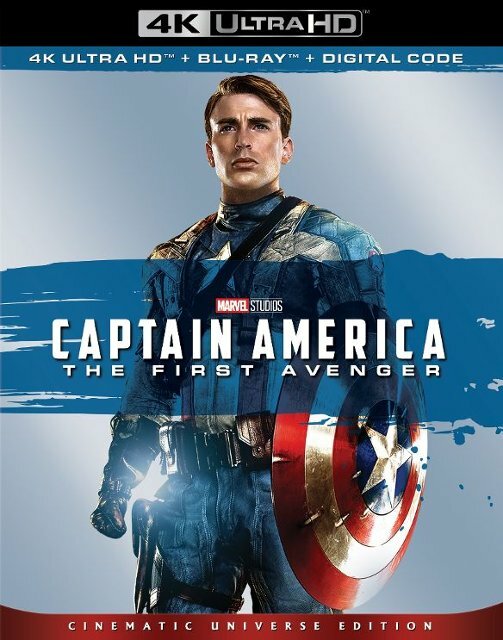 You can order order the standard Blu-ray edition or SteelBook edition of Captain America: The First Avenger from Amazon (although the SteelBook edition is much less expensive at Best Buy while it lasts).